EVA Air Corporation is a Taiwanese international airline based at Taiwan Taoyuan International Airport near Taipei, Taiwan. After learning how they are operating passenger and dedicated cargo services to over 40 international countries across Asia, Australia, Europe, and North America, I was delighted to be invited to write for them. Last year the airline earned SKYTRAX’s prestigious 5-Star certification and joined an elite group of only eight airlines worldwide.I currently have my own tech column in EVA’s inflight magazine, enVoyage. Each month I look at the best tech gadgets across a wide range of themes such as smart home tech, kitchen gadgets, sports tech, cashless travel and travel tech or how to monitor your home while you are traveling. If you are reading this after reading my column at 30,000 feet, please send me a message as I love hearing from both my readers and listeners of my podcast that is currently heard in 147 countries. 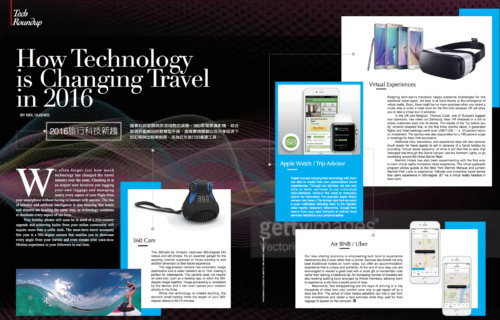 Here are a few examples from my travel tech column taken from EVA’s inflight magazine. If you are an editor of an in-flight magazine and looking to add regular technology based articles around current trends or thought leadership, please contact me directly.